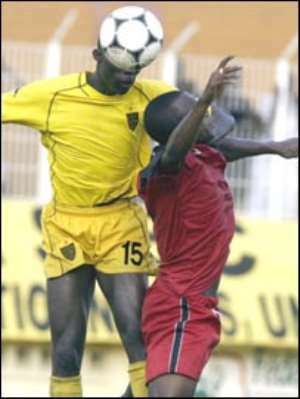 The Asante Kotoko-Asec Mimosa CAF Champions League match held at the Kumasi Sports Stadium on April 25, 2004 yielded a gross proceeds of ¢1,484,830,000. A total of ¢1,187,358,134 representing 95% pf the bulk sum went to Asante Kotoko as its share with the remaining ¢62,492,533 (5%) going to the National Sports Council. According to a GFA function statement of account intercepted by The Chronicle, ¢218,979,333 including ¢163,203,203,333 VAT less the gross proceeds was captured as total match expenses. The tickets for the match were in ¢200,000, ¢150,000, ¢100,000, ¢40,000 and ¢30,000 denominations. The gross proceeds of ¢1,468,830,000 came from the sale of 200 of the ¢200,000 tickets; 589 sold tickets of the ¢150,000 denomination and 1,173 of the ¢100,000 denomination tickets. Twelve thousand, five hundred and fifty four (12,554) out of the 30,000 ticket stock of the ¢40,000 denomination tickets were sold out while 24,034 of the ¢30,000 tickets were sold. But football fans and a section of the Kotoko supporters see the proceeds as low against the crowd that watch the match particularly when Kotoko had charged fees ranging between ¢50,000 and ¢100,000 for cars parked at the stadium. They compared gate proceeds raised during local matches during the IMC era and called for transparency in the financial administration by the present management. They have also asked management to make public proceeds of charges for vehicles, which parked at the stadium during the match. Using ticket analysis of the Kotoko/Hearts match on August 10, 2004 which yielded ¢1.6 billion and on assumption that the rates for this particularly match (¢200,000; ¢100,000; ¢60,000; ¢40,000 and ¢30,000) was used for the Kotoko/Asec match proceeds should have been ¢1,824,070,000.00. Similarly, assuming the rates for the Kotoko-RTU match of December 7, 2003 (being ¢50,000; ¢30,000;¢20,000; ¢15,000; ¢10,000 which yielded ¢571,245,000) were charged for the Kotoko-Asec match the gross proceeds should have been ¢1,872,650,000.00 using the crowd that witnessed proceedings there.